What does the Daniel Morcombe Foundation do? 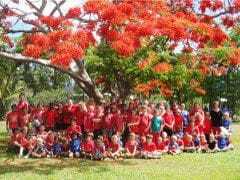 The Daniel Morcombe Foundation is committed to providing child safety education to children and young people to prevent abuse and promote lifelong health and wellbeing. We support educators, parents and carers through the provision of resources and education and also directly support young survivors of crime. The Daniel Morcombe Foundation was established in 2005 by Bruce and Denise Morcombe after their son Daniel was abducted and murdered in 2003 waiting to catch a bus on the Sunshine Coast, Queensland. Since then Bruce and Denise have campaigned to make Australia a safer place for all children. Why is child safety education so important? Research indicates that between 1 in 4 girls and 1 in 6 boys will experience sexual abuse before their 18th birthday. This is a frighteningly high statistic and the consequences for survivors can be significant, leading to possible physical or mental health issues, disordered eating and substance abuse, higher risk of suicide, aggression, violence or criminal behaviour. Experiences of abuse may lead to homelessness, isolation or prevent the survivor from developing healthy relationships in the future. 'Crimes against children have no place in modern Australia' - Bruce & Denise Morcombe. What resources does the Daniel Morcombe Foundation have to help me talk about child safety with children and young people? There are videos and activities available on our website that can help you start a conversation. The resources are for educators, parents and carers to use with children and young people. It's never too late to start talking to children about personal safety. What is Day for Daniel? Day for Daniel is Australia's largest national day of action to raise awareness of child safety, protection and prevention. 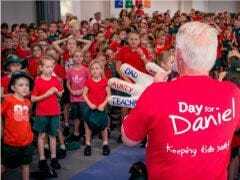 It is held on the last Friday of October every year and honours the memory of Daniel Morcombe. The theme of the day is to wear Red, Educate and Donate. Parents, carers and educators are asked to start a conversation with children and young people about personal safety. Schools and kindergartens conduct child safety education activities. Businesses and community come together to raise awareness of child safety issues. It's the Daniel Morcombe Foundation's biggest fundraiser of the year. Monies raised on the day fund our education programs, resource development and support for young survivors of violent crime. Why do we need to register for Day for Daniel? When you register your school, business or community event we can communicate with you more easily and provide you with access to resources to support your education or awareness raising activities. We can also thank you for your efforts, registering allows us to appreciate you and stay in touch. Your school registration will be automatically renewed if you have registered in the past. How do I register for Day for Daniel? Visit our website and enter your details. I want to organise an event, what do I do? Think about what you would like to do to promote child safety education in your school, workplace or community. If you are not sure about the type of event you would like to host, contact us and we are happy to make suggestions. Make sure you register the event. Does the Daniel Morcombe Foundation release balloons at events? No, we do not release balloons at events and we do not endorse releasing of balloons. For environmental reasons, all balloons with the Daniel Morcombe logo are made from bio degradable latex to minimise environmental impact. Latex balloons will degrade at the same rate as an oak leaf. If you see our balloons getting a white cloudy look it means that the degrading process has started. If our school has registered for Day for Daniel does that mean Bruce and Denise will be attending? Thank you so much for your support. Visit the donate page of the Daniel Morcombe Foundation website. Donations can be made online using a credit card or via paypal. Direct bank deposit or cheque donations are also accepted. What do our donations support? All funds that are donated are used towards harm prevention activities and improving outcomes for children and young people who are survivors of crime directed towards them. Donations over $2 are tax deductible. Your support, no matter how big or small helps to keep kids safe. How do I request Bruce & Denise to do a safety talk at my school? I have concerns for the safety and wellbeing of a child/children, who do I talk to? If you believe that someone is in immediate danger, always call 000. If you believe that a child or young person has in the past or is currently experiencing abuse, this should be reported to the relevant state or territory child protection agency. Your identity and the details you provide will remain confidential. Visit the the Australian Institute of Family Studies website for contact details of where reports of abuse can be made in each state and territory. My child was dropped off before their bus stop. Write a formal letter to the bus depot or Transport Minister in your State. My child had no money and wasn't allowed on the bus.